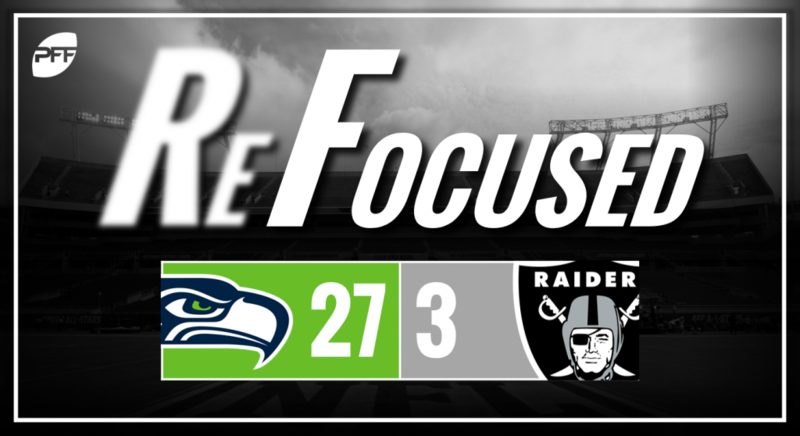 The Seattle Seahawks defeated the Oakland Raiders, 27-3, in Week 6 of the 2018 NFL season. The Seahawks, instead of spreading the ball around, focused heavily on the run game and RPOs off of them. While no running back lit up the stat sheet, Seattle’s running-back-by-committee approach led to 155 yards and killed the game off with an eight-minute drive to end the game. When Russell Wilson did put the ball in the air, he was effective and efficient with only six incompletions and gaining 222 yards. He took deep shots and helped the Seahawks move the ball. The Seahawks wreaked havoc all across the defensive line. Frank Clark got things going early, but there were excellent performances up and down Seattle’s defensive front with Clark, Quinton Jefferson and Jarran Reed all having standout performances. On the back part of the defense, Bradley McDougald was active for the Seattle secondary. McDougald did a nice job throughout at coming up from his safety position to make plays underneath, highlighted by a fumble he forced on Dwayne Harris that ultimately bounced out of bounds before anybody could recover it. The Raiders’ defense couldn’t record any pressure of note, as the Seahawks’ offensive line gave the Raiders little room to tee off on Wilson. Daryl Worley had the only interception of the game, but that came off a hit by safety Erik Harris where the ball fell into Worley’s hands. Outside of that play, Worley was beaten downfield on a couple of deep plays, as he failed to locate the ball in the air. It was an absolutely brutal afternoon for the Raiders’ offensive line. Derek Carr was knocked to the turf all throughout the day, and the Seahawks were able to get pressure on seemingly every pass play that took longer than two seconds to develop. Raiders first-round pick Kolton Miller had a particularly rough day, highlighted by a fumble where he knocked the ball out of Carr’s hands with his helmet after Clark bull rushed him into the middle of the pocket. Carr was certainly affected by his offensive line, but he and the Raiders’ passing attack had absolutely no interest in throwing the ball downfield in London. Carr attempted just a few attempts all game that traveled more than 10 yards down the field, and he wasn’t accurate with them. Wilson, while not throwing a lot of times, was highly efficient moving the ball up and down the field, as the Raiders had no answer of the Seahawks’ offense. With Doug Baldwin back, the Seahawks’ passing game looked more in sync. Seattle’s pass-rush was relentless, and Oakland’s offensive line just could not get the job done. Carr had pressure in his face virtually every time he dropped back to pass, leaving the Raiders’ passing offense dead in the water.